A night of activities from the Hands On Museum. More details to come! We invite your entire family to join fellow Leopards for a day of service and giving back to our wonderful community! With a variety of activities to choose from, there's something for everyone. Can't join us in the afternoon? No worries, come join us for dinner! Pasta with a Purpose will feed everyone who shows up! Monetary donations will go to Lawton PTO and a portion will be donated to Peace Neighborhood Center here in Ann Arbor. We hope to see you there! Our PTO has organized a Lawton Elementary Roller Skating Party at the Skatin Station in Canton for Lawton's Early Release Day on Wed, 2/27 from 3:00-5:00. Lawton students, teachers, staff and family members will receive a reduced cost of $6 per person for both entry and skate rental. Let Mrs. Blick know if you need financial help to attend event. All spectators must pay admission except parents who are not skating. More info to follow. Our next PTO meeting is 2/5 at 7:30pm in the Media Center. All are welcome. We are already starting to plan for the next school year. Please email president@lawtonpto.org if you would like to learn more about the executive board or other committee positions. We especially welcome first time volunteers! The PTO has rented Vets Ice Arena on Saturday Jan 26th from 7:10-8:10 pm for a community building event. All Lawton students and their families are welcome to come skating. The PTO will cover skate rentals for Lawton students. Student and one special adult guest night out! There will be a DJ, snacks, and other fun. This event is open to all grades as an opportunity for our students to have a some one-on-one fun time with a favorite adult. This one-mile run/walk around the Lawton neighborhood and picnic at the school includes the opportunity for students help raise money for the John R. Crosby Foundation, established in 2001 in honor of a former Lawton student. The foundation helps families impacted by pediatric cancer. Come learn more about Lawton, the Lawton PTO, and your student’s class. Celebrate the beginning of the school year with free coffee or tea for to all adult family members, caregivers & staff from the Bearclaw Coffee Truck courtesy of Lawton PTO from 8:00-9:30am on Tues, 9/4. Stop by to chat about your summer or make plans for the fall. Pre-order food and tickets by June 1 to avoid the lines at the event. We need lots of help to make this event a success. Please consider pitching in. Sign up to volunteer at the event. Donate baked goods to the cake walk. Looking for something to do when school is closed on May 8th? Take the kids to AirTime: $10 per person for $10. 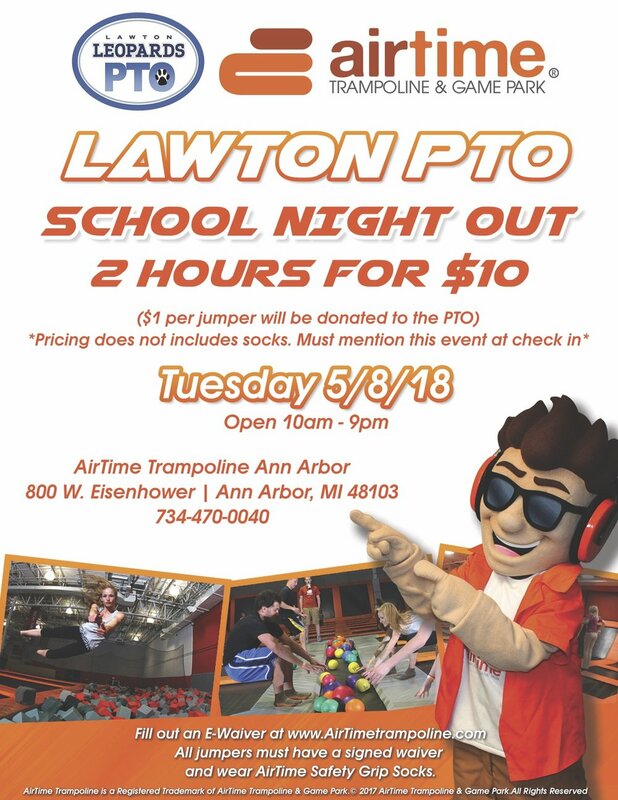 Mention you're there for the Lawton PTO and $1 will be donated to the PTO. $25 Individual tickets include food, non-alcoholic beverages and bowling. For payment, you may use PayPal online or deliver check to the main office made out to Lawton PTO by Thu, 4/5 after placing order online. No paper tickets issued. Purchaser names will be on a list at the entrance to the event. Fill a bag for $1! To volunteer, or for more information, please fill out this form. If you would like to help make a display board to represent cultures from around the world, please contact lawtonifcc@gmail.com. The Lawton PTO invites you and your family to an evening of friendship, music and dance on Friday, February 2, 2018 6-8pm at the Lawton auditorium and gym! The Lawton PTO Winter Welcome Dance is free and open to all members of the Lawton Elementary School community, including students, faculty, staff, parents and siblings. We're calling it the "Winter Welcome Dance" because it’s winter… and because everyone is welcome at Lawton! Once again, we have DJ Boost (The Neutral Zone) spinning your favorite dance, pop and Top 40 songs. Plus, refreshments and a FREE photo booth to capture the fun! For this events, parents should stay the duration of the event with their kids. All Lawton girls are invited for a free and special night out with one adult guest of their choice for dancing, light refreshments and fun! An adult needs to attend this event with the student(s). Student(s) must be Lawton students. Adult can be mom, grandma, aunt, dad, uncle, grandpa, etc. Girls may dress however they feel comfortable. They should just be prepared to dance if they'd like!